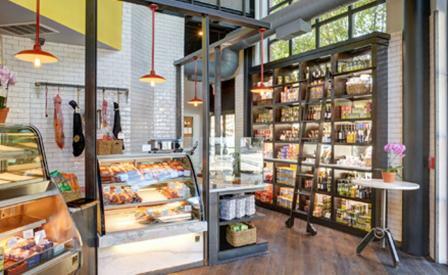 Iberian aficionados in Princeton, New Jersey, home of the eponymous world-class university, may have noticed the arrival of Despaña Foods, a Spanish food market and café from the team behind Despaña in SoHo, New York. Neat rows of canned olives, paella rice and tinned squid are housed in a striking renovation created by Princeton architectural firm JZA+D, known for their work at Singapore’s Sky on 57. The interior of the two-storey space links Spain’s rich food heritage with the industrial history of the building, a bright, Castilian-red palette weaving its way through the store.